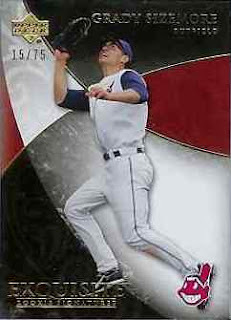 Indians Baseball Cards: Grady Grabs Gold Glove! Congratulations to Grady Sizemore for his back-to-back Golden Gloves! The last Triber to have such an honor? Omar Vizquel (SS). The last Outfielder to have back-to-back GG's? Kenny Lofton. VERY nice company to be in, Mr. Sizemore! Mauer won one too, the problem is that they are in no way reflective of any specific stat or feat of defense. Its completely subjective, like most of the awards are, and most of the times, the players vote based on who won it last year. See: Maddux, Pudge, etc. I have documented that Maddux is a good fielding pitcher, but at 157 years old, he isnt what he used to be. Pudge had won gold glove for 14 years straight just because he is pudge.